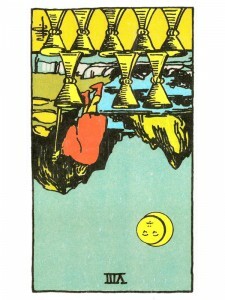 Eight of Cups (R) – As you maintain your qualities of awareness and correct response – you must ask yourself if the time to leave has really come. Are you refusing to leave this situation, determined to hang on even though you know that you have taken all you can from it? There is an indication that this situation continues to give joy and meaning? Are you leaving this situation because you lack the courage to pursue it and take everything you can get from it? Is your pattern in life to become involved in relationships, work or projects – then run when difficulties arise or when the time comes for a genuine commitment? The possibility of a new love interest always exists – be willing now to honor your own needs. Be receptive to your interests in material pleasures or when you have an urgent need for money. Acknowledge these needs and your desire for complete change. When you become bored with your present lifestyle – focus all your energy on a new direction and accept that it is not the right time to settle down. You are now ready to break your over-extension habits and stop suffocating your emotional vitality. Trust that your “inner” voice will guide you as you seek the balance that will fulfill your needs and replenish your spirit. Be absolutely sure before making any changes. Emotional/sexual excess or emotional/sexual apathy. Emotional recklessness, sexual addictions – promiscuity/cheating. Imposition – insistence on giving where it is neither wanted or needed. How can you withdraw or take time off to renew yourself? Next to Magician: You can reach the top now – think carefully before making a choice. Do what you know is right and do not listen to outside opinions. In the first position: The phrase “common love” suggests the difficulties of this path – for in seeking what is common to all of creation, temptations to and accusations of debasement may be all too “common”. In the second position: If you are too active and keep too many irons in the fire, you run the risk of not being where you need to be on occasion or of being short on the energy you need to move that mountain. In the third position: This is not a time to pursue this archetype. The effect of misapplication of principle may already be influencing events. Let the reading guide you. In the fourth position: In one extreme, this person may decide not to marry, because the pull to universality is simply too strong and demanding, to ask someone else to share. In the fifth position: In one extreme, there is some distaste here for the misuse of the sensible. In the sixth position: You must deal with a distortion of this archetype in the near future, affecting you and/or your loved ones. An over-compassionate nature may cause you some pain through confusion. In the seventh position: It concerns you that you do not feel the same toward everyone. Be patient with yourself as you try to approach this goal, but realize that just as you develop the ability to love even your enemies, you must and will have a hierarchy of those who mean the most to you, even within universal love. We must love all equally, just some more equally than others. In the eighth position: Your desire to move into new areas may be meeting with some difficulty. You may have already moved into territory that is causing trouble. This archetype is not being handled correctly by you or by someone affecting you. Back off – too much, too soon. In the ninth position: This heart is troubled with this archetype and most likely it can explain why. In the tenth position: Grace will offer you the chance to learn the shadow side of this archetype with little or no pain.